This is a piece of machine-learned art. 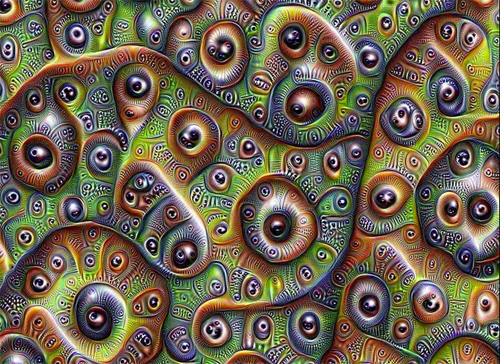 As well as the interesting conceptual metaphor of computer-generated eyeballs, it depicts an important shift in agency. At around the same time as this was happening, some hackers were getting into Chrylser’s digital car systems, remotely killing a Jeep engine while on the road. It led to the recall of 1.4 million vehicles. Right now, the gods of Silicon Valley rule our digital world. They are the masters of its domain, developing machines with human-like intelligence. Five years ago, in 2010, Sergey Brin declared his aim. ‘We want’, he said, ‘Google to be the third part of your brain‘. Now, wearables, apps and the ‘new normal’ conditions associated with being online are generating new powers of agency for providers vying to have a piece of the space in our heads; they can understand how we behave, know what we do, and share content well outside our own sense of domain. The human relationship with code’s become porous. Being hooked up digitally means being hooked up to a mass of connections extending beyond us and far outside our control. We’re talking today about smart cities, hive minds and global ambitions for connected intelligence, not thinking too much about what we might have to give up for it. The global wired up superbrains being made today can bring a great deal to augment human potential but equally, code has the means to override what we know as a native state of humankind, altering what we choose or define as our essential and preferred state of being. Before we become fully conditioned by programmatic advertising and algorithmic calculations I think we owe it to ourselves to have a conscious conversation about this. We’re at the point today where artificial intelligences are – right now – hacking away our human boundaries. My friend Jon Husband, author of Wirearchy, recently asked a question on Facebook: ‘Is this all an illusion?’. Several people in their responses agreed with the instinctive sense of what he was saying. Life might be feeling illusory because code is beginning to give us a detached sense of agency. And what we know as the truth, what feels like the truth, seems harder to grasp as a consequence. As the first generation of digital humans, we haven’t fully comprehended how digital agency may be impacting on us. We’re not fully conscious about the choices we make when we consume and expose ourselves to digital content and how it affects us. Most big online providers aren’t sharing the data. We don’t talk about the digital morality of it, it just is. But it’s worth remembering it’s us who have the ancient treasures of humankind to protect and maintain as we go digital for the generations that follow. And we need to defend our sense of human agency by thinking about the umbilical connection we now have with code, asking questions about it consciously with the curiosity of children and making decisions about it collectively with the wisdom of elders. This may be one of the most important acts of agency we ever undertake. being yes or no choice which in Binary Choices trading are referred to as Put or Name trades.